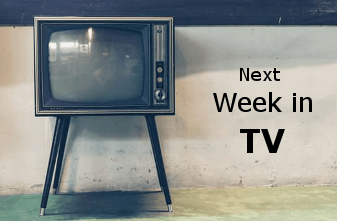 Next Week in TV 6/17: Get your binge on, Luke Cage Returns! The highlight of this week for us has to be the return of Netflix’s Luke Cage. While we are looking forward to the new shows debuting this week and finales, binging season two of Cage will be the highlight. Given the overwhelming reception of season one and Black Panther, we are hoping for a well written and rounded series. By all early reviews we have read, season two will deliver and is not to be missed. Plan the weekend according! Sundance Now’s Next of Kin and Epix’s Deep State, are also on our radar. The well written and acted series Next of Kin follows a family Doctor in London whose brother is brutally murdered while working overseas. Epix’s Deep State follows an ex-spy, Max Easton as he is pulled back into his old profession to discover the reason for and avenge his estranged son’s death. Other returning show’s include Drunk History and the Great British Baking Show for their 5th seasons. There are two season finales of note this week. The popular Into the Badlands and Supergirl will wrap their seasons. The jury is still out for a renewal for Into the Badlands but Supergirl will be back in the fall as part of the new CW Sunday lineup. So there you have it TV fans! As always, to keep the TV chat going, please visit the FoCC forum by clicking here. Until next time, have a great week and happy viewing everyone! On-going: Westworld, Into the Badlands, Fear the Walking Dead, The Expanse, Legion, Cloak & Dagger, Big Hero 6: The Series, Supergirl, and Dragon Ball Super. New, Binging & Watching Live: Luke Cage, 12 Monkeys, Colony, Fear the Walking Dead, Ghosted and The Expanse. Catching up: Legion, Badlands, Hard Sun, Santa Clarita Diet, Sneaky Pete, Runaways, Atlanta, The Tick, Handmaid’s Tale, Lost in Space, Krypton, Timeless, Magicians, Deception, Good Girls and Star Trek Discovery. Sundance Now, AMC Networks’ premium video streaming service [is hosting] a gripping and timely international thriller. All episodes of the six-part drama, shown for the first time in the US, star Primetime Emmy(R) Award winner and Golden Globe nominee Archie Panjabi (The Good Wife) and Jack Davenport (Pirates of the Caribbean, White Famous) and will be available to binge at once. “Next Of Kin” follows whip-smart General Practitioner Mona Shirani (Panjabi) who lives a charmed life at the heart of a loving family in London. Unfortunately, she is left grief-stricken when her beloved brother is brutally murdered while working for a medical charity overseas. As the death brings buried family secrets to light, Mona is drawn into a tangle of betrayal, conspiracy and murder. One way or another, she must find a way to protect herself, her family and her career as they are all put at risk.